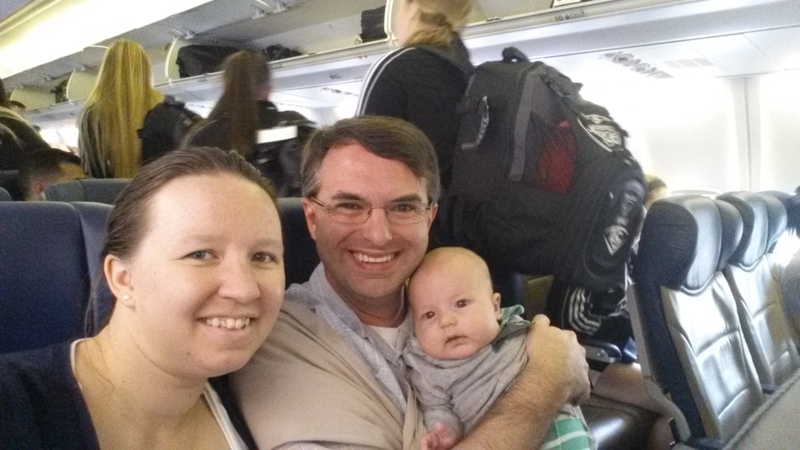 Here is a look at mini-mans first plane ride and adventure outside of Orlando! Two days after we took our first sailing trip, Damon had a conference in Atlanta. Not wanting to have to care for a three-month old by myself for four days, mini-man and I decided to go with him. Daunted by taking a three-month old on a plane trip, I did some research to see how I could make it more bearable for mini-man. Thanks to our preparation, we made it to the airport in plenty of time. Unfortunately our flight was delayed four hours (we were never told why). This put us into Atlanta later than we hoped and I felt very stressed. We needed to walk to a nearby store to get supplies for mini-man and me. Once these were acquired, we hoped that there would be a restaurant open nearby. Unfortunately, it was almost 10p and everything was closed. We settled for eating at the overpriced hotel restaurant (ok food, but at least it was food). Due to the stress from the day before, I had planned to stay in the hotel room with mini-man for the day while Damon went to his conference. Unfortunately, I found mold in the bathroom! We called down to the front desk once we got back from breakfast and asked for a new room. They immediately responded, but that meant we had to pack everything up and move. Not too bad, but definitely not what I wanted to do on our down day. The next day, I decided to be a little bold and take mini-man to the Aquarium by myself (my first time attempting this!). It wasn’t too bad – we took our time and got to see a lot of the exhibits. However the dolphin show did not go well. This show is located in a concrete theater that had quite a few school children on a field trip in attendance. Once we were seated, the MC asked everyone to shout – and you can probably imagine how loud it got. The noise scared mini-man and he started crying. At this point, I figured we were done and headed to meet Damon. The next day was Damon’s last day at the conference, so mini-man and I stayed in while he finished up. Afterwards, we checked out the Coca-Cola tour. This was a little disappointing. Expecting a factory tour, instead we got a marketing gimmick – not worth the $16 a person. Our final day in Atlanta was our most adventurous. We managed to pack and get out of the hotel fairly early (i.e. : 11:00a) and decided to explore the city a little. Being an architect, Damon heard a lot about this shopping district called the Underground. However, this place left much to be desired. We arrived to discover an empty shopping area with few stores but a lot of loitering. Instead of exploring we decided to grab some food and then head to the zoo. Although it was hot, we managed to see quite a bit of the zoo by taking our time and stopping a lot to drink. However, towards the end of the visit, it started to pour! With little time left we made a run for it and just made it to our bus. A short time later, we got to our hotel, dried off, changed, and headed to the airport. An action packed trip to be sure, but we survived and learned quite a bit. Can’t wait for our next adventure!